Should You Buy a Toy Sewing Machine for Kids? I learned the hard way the when buying a kids sewing machine, stay away from the toys! Several years ago, I purchased some a toy sewing machines for each of my five oldest grandchildren. The machines cost about $25 each. They did not last. Pieces broke off, parts quit working, and it was a dismal purchase overall. Trying to sew on the machines was an exercise in frustration for both the kids and the adult trying to help them learn to sew. The kids were so disappointed! Finally, my daughter and I decided that we wanted them to learn on real sewing machines. It turns out that for very little more than I paid for toys, you can buy a good used sewing machine. Sometimes you can even find a new, steeply discounted machine online. If you prefer to buy new, you can get a quality machine for less than $75 with free shipping on Amazon. Sewing skill is an important skill for young people to learn. Not only can they make their own clothes, they can make one-of-a-kind outfits that no one else will have. And even now, even at the high price of fabric, homemade clothing, made correctly, outlasts and out values store bought clothing. For instance, using comparable fabric, I can make a blouse for $15 that would cost me $60 to purchse. Sewing saves money. 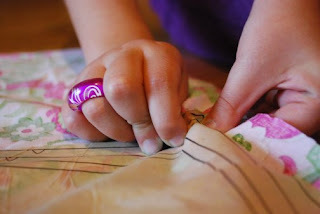 If you don't sew, it could be a craft you and your child learn together. There are lots of places you can take lessons at a reasonable price, but YouTube.com has many, many how-to videos for sewing for free. You can learn without costing anything but the expense of the machine and a few sewing essentials. This is a prefect homeschool class for kids, both boys and girls. In today's economic downturn, being able to sew is going to be a necessary skill to maintain wardrobes and make clothes. You can even cut quality used clothes and make new clothes from them. Overall, a sewing machine is a tool everyone should have. Why not start your child off on a lifetime of creativity? I bought is a heavy duty, high speed machine that sews really fast. This Brother machine is budget priced, and offers many features that make it worth having. One of the girls spends a lot of time making purses and other small items on the machine. On any machine, the minimum I expect is a zigzag stitch and a built-in buttonhole function. This machine exceeds both these requirements. This lightweight machine is full-sized, and has 10 built-in stitches. The button on the right makes it easy to reverse stitch, and with a quick change, you have a free-arm machine that easily sews small items and cuffs. So, should you buy a toy sewing machine for your kids? In my personal opinion, no. The toy won't last, and if your hope is that your child will learn to sew and learn to enjoy sewing, a toy will definitely not be worth the time, effort, and expense. I recommend either purchasing a low cost 'real' sewing machine, or purchasing a used sewing machine. Do your kids sew, yet?